In certain areas it is very hard if not impossible to grow cactus and succulents plants in and around your home. This has made artificial cactus more popular because of their realistic looks and ability to be used indoors or out. Of course professional designers can make them look very realistic but there are a few tricks that you can use to get the most realistic look out of your artificial cactus gardens. If you’re making an outdoor artificial cactus garden then you’ll want to stick with the cactus and succulents that are made of a plastic or poly blend material. Traditional silk or fabric flowers and plants will fade in the harsh UV rays causing them to turn an unnatural color. Typically the saguaro’s, barrels and different styles of echeveria tend to be made of a plastic material rendering them for better use in outdoor applications. Try using a sandy type of dirt to plant them in and maybe try topping off with some pea gravel for more realism. Using a taller cactus along with two or three smaller ones right next to it will give your garden an authentic look. You can also use some other southwestern décor to place in and around the garden for a fun and distinctive look. 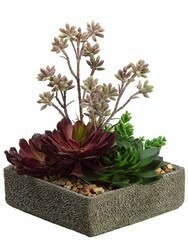 For indoor artificial cactus gardens you can use any type of cactus or succulent you desire. Place them in terra cotta or some type clay style planters for an authentic southwestern look. Once again you can use sandy style dirt and add some pea gravel or small rocks to the top to give it a realistic look. By placing a watering tray underneath the planter it gives it a realistic look. The same rules used outdoors can be used indoors, placing a taller cactus or succulent with two or three smaller ones right next to it makes the arrangement look natural. Yucca grass, sanseveria and sedum succulents work great to give some height. Taking some time to think about how you want your artificial cactus garden to look will help you greatly when you’re ready to start your project. Remember nothing you do is ever wrong as long as it looks good to you. There are many styles of cactus gardens and doing a bit of pre planning before you start will render the best results. Click here to view our selection of artificial cactus. At your home the artificial trees and shrubs can easily boost peaceful sensation which enables them to end up being placed everywhere since they will not need sun light. You can have these in your living room, your master bedroom, and several people also prefer to place these in the bathroom. Some great tips and explanations on how to create and put together an artificial cactus. They are very easy to follow.